Erica on the blog with another super simple, but rather eye-catching, card. Recently I got the second lot of Distress Oxide inks and ooooh, that Picked Raspberry... L-O-V-E!! Well, I simply had to use it on several projects right away because #lovepink, am I right? Getting a piece of smooth water colour card stock out, as well as arming myself with Worn Lipstick, Wilted Violet and Fossilized Amber in the Distress Oxide inks too because options. Right-o, I basically went to town with blending and adding colour as I wanted the background really, REALLY vivid. Once I was happy it was colourful enough, I spritzed some water drops on it and lifted that off with a piece of kitchen roll. To hurry up the drying process, I used my heat gun on it until it was bone dry so I could run it through my Big Shot with a stitched die. Then it was time to add images and sentiments. As my plan was to heat emboss the image in white on vellum I picked the one I think makes the biggest splash on its own: Beautiful Bloom-Sweet Rose. Before stamping it up, I made sure to use my anti-static tool all over the vellum to avoid those pesky little sticky bits where you don't want them. Once it was set with my heat gun I set it aside for a minute to cool down. This one I also die cut with a smaller size of the stitched dies to add some detailing. 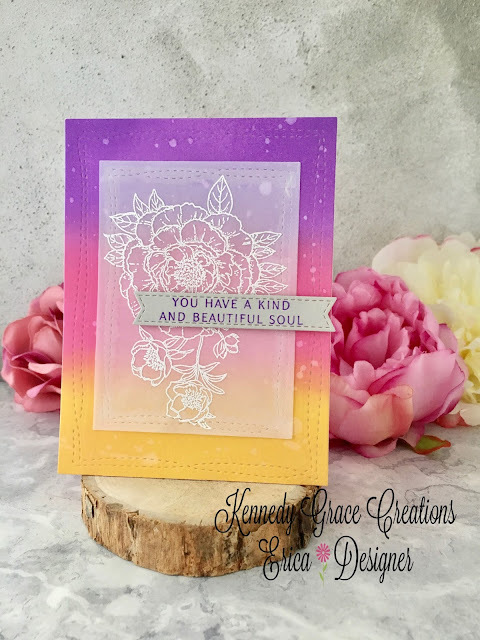 For the sentiment I used one from the Kind Soul stamp set from WPlus9 'You have a kind and beautiful soul' and this I stamped in Wilted Violet Distress Oxide ink on pale grey card stock. Adhering the vellum to the card base I used a vellum friendly double sided tape but I think this tape is a bit of an overachiever as it still does show through a bit. Finally I added the banner with the sentiment with thin foam tape to raise it up just a tad and with that, the card is done! I hope you like it and if you are on the fence about the Distress Oxide inks, I'd say get them. They blend like butter and are so much smoother than the original Distress inks. Start small if you still aren't convinced. this is so pretty, i haven't ventured to the oxides yet, but you mare making me think about it.